There's many things in the Oval Office that's worthy of mentioning due to the historic significance of the object such as the bust of Martin Luther King. It was rumored to have been removed by Trump on Inauguration day which was not true. The bust remains on a pedestal in the Oval Office. The desk he chose out of six possible choices. 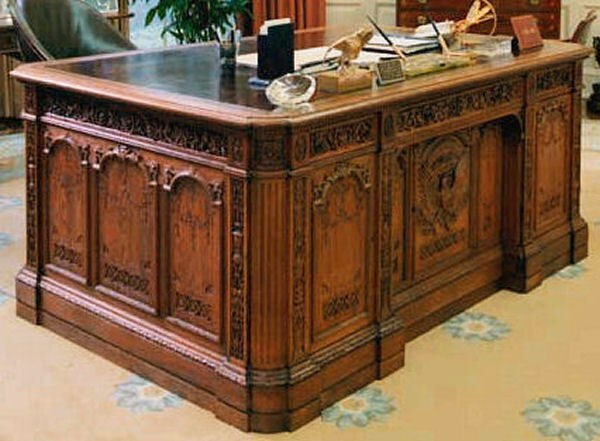 The Theodore Roosevelt desk has been used by seven presidents in the Oval Office, making it the longest-serving desk. 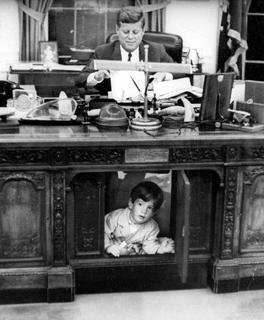 The Resolute Desk has been a presidential favorite. It was a gift from Queen Victoria to President Rutherford B. Hayes in 1880 and was built from the English oak timbers of the British Arctic exploration ship HMS Resolute. Franklin Roosevelt requested the addition of a door with the presidential seal to conceal his leg braces. There is a famous photo of 'John-John' and Caroline Kennedy peering out from behind that door. These presidents have chosen the Resolute Desk. 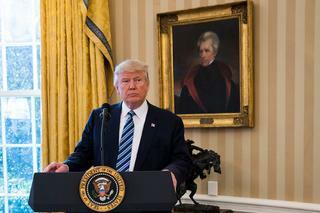 One of the most significant (in my opinion) objects in the Oval Office is the portrait of Andrew Jackson that hangs in a prominent position just to the left rear of the Resolute Desk. Trump likes to have Andrew Jackson in many of his Oval Office photos. Andrew Jackson’s historical reputation has declined sharply in recent decades, especially among Democrats. The party that once celebrated him as a central pillar has rushed to remove his name from symbolic places of honor, distancing itself from his record on slavery and the forced relocation of American Indian nations from the South. Trump made an attempt at humor referencing Elizabeth Warren's claim to have Cherokee blood which she has since apologized for multiple times. He tweeted what appeared to be a joke about the Trail of Tears, the 19th-century removal of Cherokee people from their homelands that killed thousands. Andrew Jackson can be seen in two very different ways, just as Americans look at populism in two different ways, we like it, because we like the idea of people having power over government. And we don’t like it, because it has within it an undercurrent of racism and violence. But it wasn't only Cherokee tribes that were relocated, the Chickasaw, Choctaw, Creek, Seminole, and Cherokee people (including mixed-race and black slaves who lived among them) were forcibly removed from their traditional lands in the Southeastern United States, and relocated farther west. Andrew Jackson's support for removal of Native Americans began at least a decade before his presidency. Indian removal was Jackson's top legislative priority upon taking office. I could easily draw parallels between Andrew Jackson removing Native Americans with Donald Trump wanting to remove all Mexican and Central American immigrants. Last edited by HumblePi; 02-11-19 at 08:36 PM. Not all Seminole indians left florida. Chief Osceola refused to leave and led a gorilla war against the army. Hit and run, not outright fight them, ambush them and split. The army never did get Ocseola out of florida.